The Health Insurance Portability and Accountability Act of 1996 (HIPAA) protects a patient’s health information, and it also extends to responses to patient reviews online. This means that healthcare marketers need to write HIPAA-compliant responses to reviews. Specifically, you need to be able to reply to a review without referring to any specifics about medical care or the patient’s identity—which could be construed as “patient data”. This tightrope act might sound daunting, but it’s actually easier than you think. We’ll use this guide to provide some best practice tips when handling future reviews, but we’ll also show off some real-world examples to give you a better idea of how to craft HIPAA-compliant responses. The best way to tell if a review response is HIPAA-compliant is to see if it goes into detail about the patient’s treatment or mentions specifics about their visit. Responders who bring up these details are potentially violating HIPAA guidelines. If you didn’t know you violated HIPAA guidelines and “by exercising reasonable diligence would not have known” that you violated the rules then the penalty can range between $100 – $50,000 per violation. Violating the rules “due to reasonable cause” and not because of to willful neglect will cost you $1,000 – $50,000 per violation. Breaking the rules because of willful neglect and correcting the mistake in the appropriate amount of time amounts to $10,000 – $50,000 per violation. Violating HIPAA guidelines because of willful neglect and not correcting it in time nets the highest penalty at a flat $50,000 per violation. The maximum total amount penalized to the offending group is $1.5 million per year. The penalties above not only hurt a healthcare group financially, but it also has the potential to negatively impact its reputation. So how you do you avoid these pitfalls and effectively respond to reviews? Have a plan in place, aka, keep a cool head. The most important thing when responding is that it shouldn’t be impulsive. Always strive to maintain a calm tone and have a professional writing “voice” when responding. Say “Thank You.” Part of that “voice” involves showing your appreciation for the feedback whether it’s positive or negative. Saying “Thank You” shows that you take every piece of feedback seriously in order to further improve the patient experience. Take the conversation offline. The best way to help patients with issues or additional comments is by directing them to a specific number or department where they can freely discuss specific issues. It also relieves you of any potential breaches of HIPAA guidelines in further online conversations. So how do these tips work in a real-world scenario? We’re glad you asked. As a precautionary measure, Saran Zamora, the marketing coordinator at Nicklaus Children’s Hospital, and her team utilize pre-drafted responses. Zamora’s approach allows her team to respond to every review in a professional manner that doesn’t bring up specifics. Furthermore, the response also encourages reviewers to go offline if they want to bring up additional details about their experience. 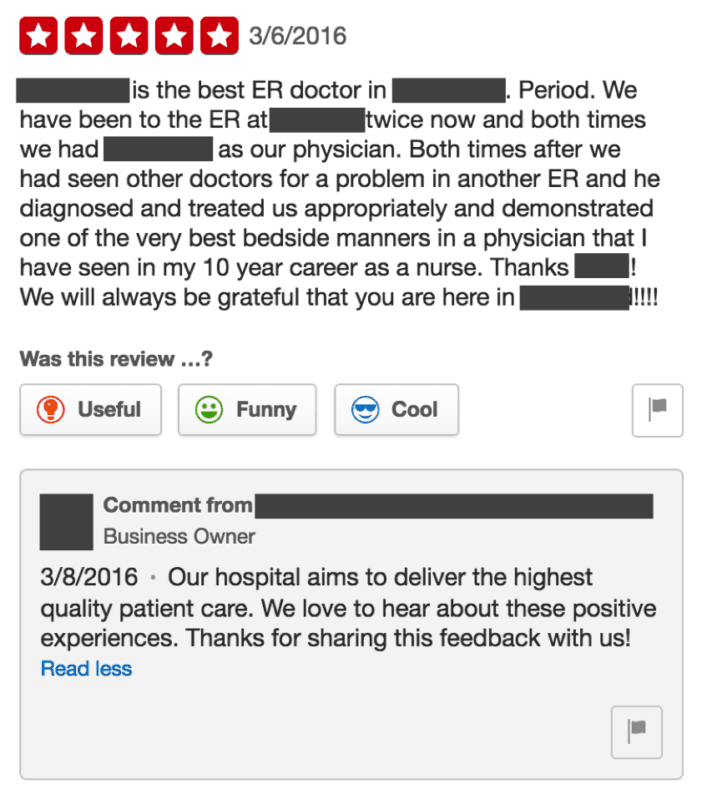 We also recently talked about the importance of a healthcare listing on Yelp, and that’s where we can see more examples of patient review responses in action. Specifically, Dr. Danika E. Brinda of Planet HIPAA wrote a Yelp blog post that provided the examples below, which fall into two separate categories. 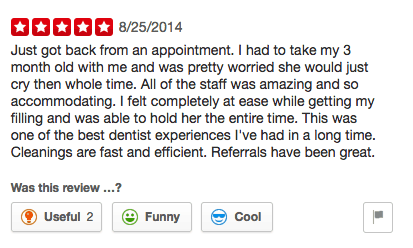 Take a look at the response to this patient review. Spoiler alert: it meets HIPAA guidelines. Here’s why: it’s a general response that doesn’t go into any details. It doesn’t explicitly say that the reviewer was a patient at the hospital, and if they were, the response doesn’t provide any details about their visit or treatment. Instead, the response is a simple “thank you” for the review while also touting the hospital’s mission of providing excellent patient care. Unlike reviews, responding through direct messages on sites like Yelp are kept private between you and the patient. However, it’s still important to remember HIPAA guidelines in your response. As always, remember to keep responses as general as possible. The response above doesn’t include specific information about the patient or their visit. What’s even more important is that the responder encouraged the patient to make additional comments offline. This ensures that future communication about the patient experience and other specific items is strictly between the reviewer and the provider. Furthermore, any digital footprint of the review and subsequent responses, whether they are public or private, is free of any HIPAA violations. Even though HIPAA came into the picture before the review-world came into existence, the concepts of HIPAA still apply. Patient reviews are a vital part of healthcare organisation’s identity. It’s every doctor’s responsibility to protect patient privacy, though wanting to respond. Even the most knowledgeable organisations can struggle with how to respond to patient reviews while maintaining patient confidentiality. It seems to me, that if a patient puts her medical treatment online for all to see, and makes false allegations, the physician should be able to correct those false statements with the medical care that actually occurred. When the patient puts her healthcare out there for all to see, she is giving permission for all to know about her healthcare. Anything less is unfair to the physician.